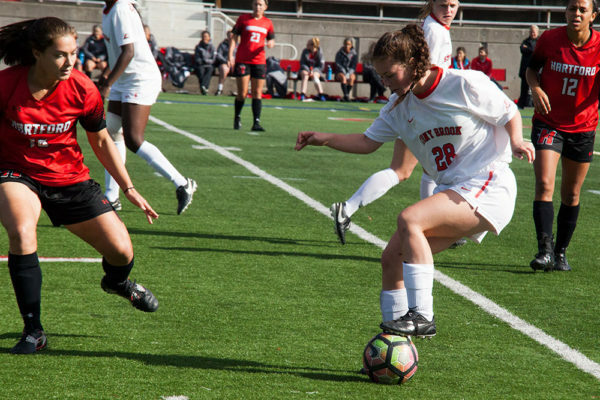 Stony Brook Women’s Soccer’s six-game winning streak came to an end on Sunday when they fell to Hartford, 1-0. The home loss was the team’s first since its first game of the season against Bryant University back in August. The Seawolves kept the Hawks scoreless through the first 99 minutes of play, but would ultimately fall to Hartford 1-0 after surrendering the game winning goal in the 100th minute. The team finishes the regular season with a 6-2-0 conference record that makes it the three seed in the America East Championship. Senior defender Caitlin Smallfield scored the game winning goal on a header that deflected off of the right post, rolled to the left post and in the net for a score. The ball rolled slowly after it first hit the post, but Gallagher had already committed to the right side and was unable to recover in time for the save. The goal was the first goal at home the team has allowed since Sept. 16 against Delaware. Neither defense was effective. Each allowed four shots and the Seawolves defense began to falter in the second half. The team allowed nine shots following halftime while accumulating just three. Faherty stressed that his team let up too many good kicks in dangerous spots on the field, and he was not impressed with the defensive effort despite holding the team scoreless. But Gallagher played very well inside the net, aside from the overtime goal. Though her shutout streak at home has ended, she had made multiple diving saves that could have blown open this game. In the 86th minute, Hartford’s shot attempt hit off the crossbar and back to another Hartford player who ripped the ball toward the net that was met by a diving Gallagher. Despite the loss, the team will enjoy home-field advantage in the first round of the America East Conference playoffs. With the regular season over, the team will prepare to take on Vermont in the first round of the America East Conference Playoffs. The Seawolves shut them out 2-0 in the team’s last visit to Kenneth P. LaValle Stadium. “I think we are super excited that we get to have a home game against a Vermont team that has some pretty dangerous players.” Faherty said. The game will be played on Thursday at 7 p.m. as Stony Brook will attempt to advance in the playoffs for the first time since 2013. That year, the Seawolves took home the America East crown.